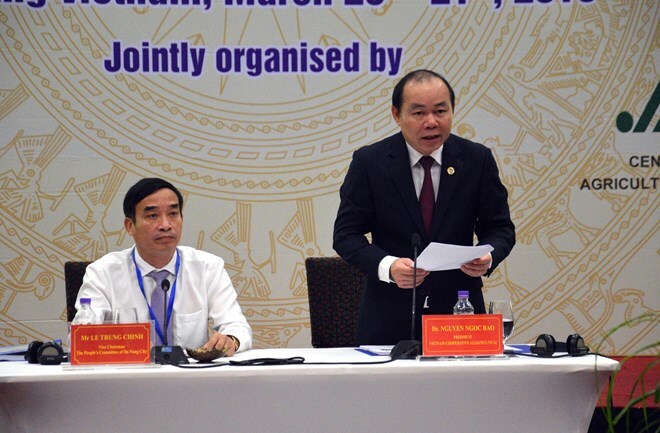 Da Nang (VNA) – Members of the Asian Farmers’ Group for Cooperation (AFGC) shared new production models that are adapted to the effects of climate change during its 19th annual conference held in the central city of Da Nang from March 20-21. Head of the National Cooperative Union of India Ved Prakash Setia said the Indian government issued a seven-point strategy in a bid to double farmers’ incomes by 2020. He cited the zero budget national farming model in the southern state of Andhra Pradesh as an example, saying that it uses cow pats and urine to enrich soil in cultivation, instead of harmful chemical fertilisers and pesticides. Head of the Cooperative Federation of Thailand Poramate Intarachumnum said Thailand has been hard hit by the impacts of climate change, such as flooding and drought, causing it to launch an action plan to mitigate green house emissions and produce technology to create artificial rains. Former Thai Prime Minister Thaksin Shinawatra launched the “One Town, One Product” (OTOP) programme to support products that are produced and sold in localities, which is now underway in over 7,000 Thai villages, he said, adding that OTOP products were worth 4.88 million USD in 2017. Vice Executive Chairman of the Republic of Korea’s National Agricultural Cooperative Federation (NACF) Lee Jea-sik said NACF has set up a disaster response fund; provided free agricultural materials, pesticides, and seedlings for re-cultivation; as well as encouraged the purchase of crop insurance and the switch to crops adapted to subtropical climate. Head of the Vietnam Cooperative Alliance’s Department of International Cooperation, Pham Thi Hong Yen, said the alliance has adopted measures to deal with climate change challenges such as ensuring food and water resource security, sustainably protecting and developing forests, enhancing biodiversity preservation, and improving inter-sectoral coordination in the effort.